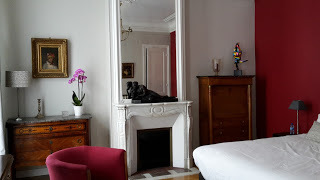 I visited the apartment for some friends in Paris and couldn't get over the coolness of their apartment. The below pictures are not even of the apartment itself, it's of the spaces outside, in the corridors of their building and outside. Situated in the Eastern side of Paris, a lot of the apartments in the building were actually studios of artists, which could be the reason for the artistic coolness in the hallways. Who would have thought that Parisian apartments could be so spacious ? !